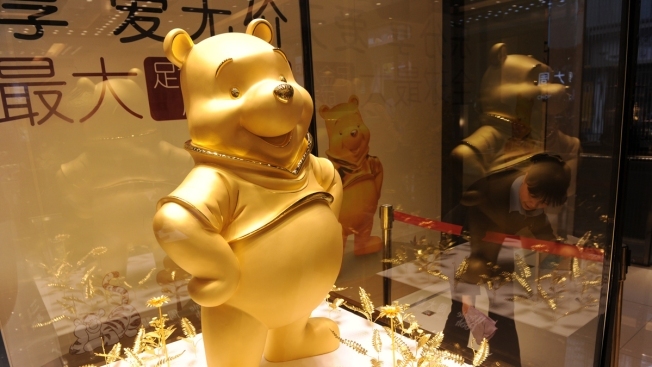 This March 22, 2012, file photo shows a gold figure of Winnie The Pooh displayed at a jewelry store in Chengdu, China. But images and mentions of the character on social media seem to have fallen afoul of censors in the nation in July 2017. Winnie the Pooh is a fictional persona non grata on some Chinese social media sites, where censors are scrubbing images and mentions of the bear, NBC News reported. On the popular chat app WeChat, stickers of Pooh and friends were no longer accessible, while Weibo no longer showed memes comparing President Xi Jinping to the bear. That longtime meme is being blamed for the censoring in the absence of an official explanation. WeChat's developer declined to comment to NBC News. "To ban Winnie because someone has compared him to Xi?" one student said. "What the heck, give Pooh and President Xi a break!" Chinese President Xi Jinping presented German Chancellor Angela Merkel with two unique gifts ahead of Friday’s G-20 Summit: a pair of giant pandas. The two pandas, Meng Meng and Jiao Qing (which translates to “Sweet Dream” and “Darling”) will be loaned out to the Berlin Zoo for the next 15 years. It had been five years since the zoo last had pandas.